The CL2 Planar offer a rich audio experience... for rich folk. Planar magnetic headphones don't use the magnet-and-coil driver typical to most cans. Instead, they use a fixed but flexible diaphragm that undulates to create sound. RHA is the first company to concentrate this technology into wireless earbuds (the kind that are tethered to a Bluetooth collar that hangs around your neck). The CL2 Planar earphones are an impressive, and expensive, engineering feat, but how do they sound? The planar magnetic audio experience is pretty wonderful. The tech is meant to deliver less sound distortion in both bass and treble ranges, and crucially, they do sound tangibly better. I've walked the gauntlet of high-end audio before, discovering planar magnetic headphones from the likes of Audeze and realizing there are better listening options out there, if you're willing to pay for them. RHA's new headphones deliver a similar audio experience, and the demo tracks on both my own phone and a dedicated music player sounded equal parts crisp and rich. They sound like premium headphones, but now they're in the form factor I personally love (and use) the most. 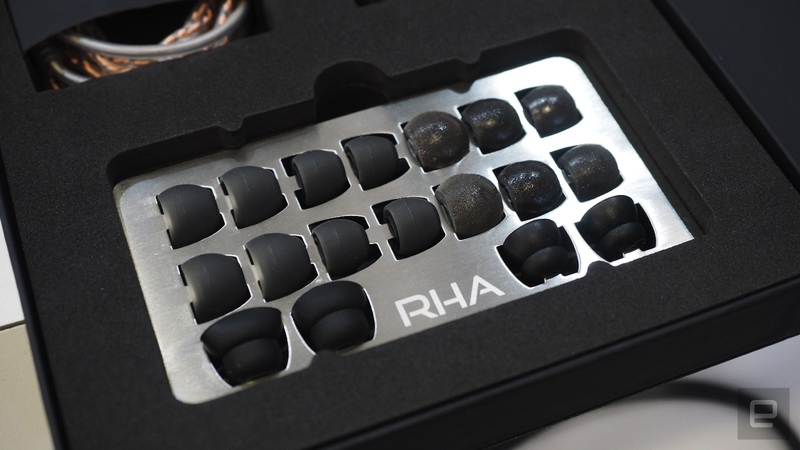 Even the box bears all the hallmarks of the premium equipment RHA is known for. The CL2 Planar earphones are packaged in a fold-out presentation box that includes a metal card with machined holes providing a home for a plethora of silicone and Comply foam buds. Alongside the charging cable and travel adapter, you get braided and silver-coated cables to turn them into wired earbuds. I love the fact you get everything you need to easily convert them from one form factor to another. On the audio gear itself, RHA has used a scratch- and stain-resistant zirconium dioxide coating, which sounds fancy, even if there's not much to derive from it at a show floor listening station. The buds are initially separated in the box. You then choose whether to attach a traditional wire to plug them into anything with a headphone jack, or opt for the wireless collar. The neck cable is of ample length, which means they don't tug on the battery band as you listen along or adjust volume and cycle through tracks on the in-line remote. But all this is attached to a $900 (£800) price tag -- the CL2 Planar is made for audiophiles that demand these kind of customization options, quality and cutting-edge tech. Yes, they're far more expensive than standard dynamic driver headphones and earbuds, but unless you're already dabbling in very high-end headphones, the improvement is a noticeable one. Nine hundred bucks' worth, though? That's harder to answer. I have concerns over battery life, but they might be misplaced. Planar magnetic tech typically consumes more energy than dynamic drivers, and space is at a premium on smaller headphones like wireless buds. RHA claims users will get up to 12 hours playback, which is a decent figure, but one we'll need to scrutinize when a review pair arrive.